Bladder accumulators from Eaton Hydraulics Group Australasia are available in a wide range of bladder materials to suit varied fluid power applications. Eaton bladder accumulators consist of a fluid section and a gas section, with the bladder acting as a gas-proof screen. The fluid around the bladder is connected with the hydraulic circuit, so that the bladder accumulator draws in fluid when the pressure increases to compress the gas. When the pressure drops, the compressed gas expands and forces the stored fluid into the circuit. Buna-N bladders and seals are supplied standard and suitable for most fluid power applications. Various other materials are offered to provide compatibility with a wide range of fluids, working temperatures and permeation requirements. 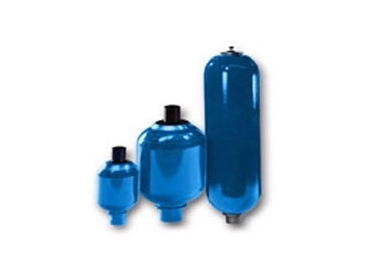 Bladder accumulators are also available with protective coatings and corrosive resistant materials for accumulator parts that come in contact with certain aggressive or corrosive fluids, or are exposed to a corrosive environment. Eaton bladder accumulators can be installed vertically, at any angle or horizontally depending upon the application. When installed vertically or at an angle, the fluid port must be at the bottom. Energy storage applications require vertical mounting while any position from vertical to horizontal is suitable for pulsation damping, maintaining constant pressure and volume compensation.